The updates below are all arranged in the same way the book is ordered so look for the relevant page number. Please note that they refer to the 4th edition of Japan by Rail. Sadly, if you have a copy of the 3rd edition you will find it is now very out of date. We therefore recommend buying a copy of the 4th edition! On this page we will also share any feedback we have received about travelling in Japan. One of the advantages of receiving feedback is that it gives us ideas of places to include in future editions of Japan by Rail, but will also help anyone planning a trip. We will also include any new museums or other attractions we hear about that we think will be of interest but which are not in the current edition of the book. We will try to keep this website as up to date as possible, but if you find anything in the 4th edition that has changed we would very much appreciate hearing from you so we can put the update here for the benefit of everyone! Go to the Contact us page to contact Japan by Rail. Both the yen/sterling (£) rate and yen/US dollar ($) rates have changed quite a bit since the 4th edition was published in July 2016 so the below is an update of the exchange rate equivalents based on those valid on 12th April 2017. Japanese nationals can no longer buy a Japan Rail Pass unless they have lived out of Japan for 10 consecutive years or more. The Japan Rail Pass will now continue to be sold in Japan until 31st March 2019. The usual regulations regarding eligibility for the pass apply (see also Who can use the pass). Passes can be bought at Narita, Haneda, Kansai and New Chitose (Sapporo) airports as well as at Hakata, Hiroshima, Nagoya, Niigata, Osaka Sapporo, Sendai, Takamatsu and Tokyo stations. As you can probably see the passes are more expensive if bought in Japan so it is still worth getting a pass before you go. New pass: 5-day Okayama Hiroshima Yamaguchi Area Pass ¥13,500 (£99/$123), ¥14,500 if bought in Japan. The pass is valid for non reserved seats on the Sanyo shinkansen (Okayama to Hakata) as well as non-reserved seats on express trains and between Takamatsu (Shikoku) west and Hakata (Kyushu) and as well as north from Shin-Yamaguchi to Masuda including Tsuwano. 3-day Northern Kyushu Area Pass ¥8500 (£62/$78); 5-day Northern Kyushu AreaPass ¥10,000 (£73/$91); 3-day All Kyushu Area Pass ¥15,000 (£109/$137); 5-day All Kyushu Area Pass ¥18,000 (£131/$164). JR Central now offers a selection of tourist passes: Takayama Hokuriku Area Tourist Pass (5 days; ¥14,000/£102/$128); Ise–Kumano–Wakayama Area (5 days; ¥11,000/£80/$100); and Mt Fuji–Shizuoka Area (3 days; ¥4500/£33/$41). These are in addition to the Alpine–Takayama–Matsumoto Area Pass (¥17,500/£128/$160) already mentioned in Japan by Rail. For full details see touristpass.jp/en. JR East & JR Hokkaido have introduced a JR Tohoku-South Hokkaido Rail Pass (valid 5 days in 14; ¥19,000; see jreasthokkaido.com for details). There is also now a 3-day Southern Kyushu Area Pass ¥7000 (£51/$64; up to 10 free seat reservations); see JR Kyushu rail passes for details. Note that Japanese nationals can no longer buy JR Kyushu rail passes. From 1st March 2018 there are some changes to the All Shikoku Rail Pass. The 2-day pass is no longer offered but a new 7-day pass has been introduced: ¥12,000 (£94/$115). Travel to Shodoshima on services operated by Shodoshima Ferry and also buses on the island operated by Shodoshima Olive Bus Co are now included in all the passes. JR Shikoku has also introduced a Kagawa Mini Rail & Ferry Pass. This costs ¥4000 and is valid for two consecutive days. The pass includes travel on: the JR Shikoku line between Takamatsu and Kanonji and also to Kotohira; the Takamatsu-Kotohira Electric Railroad line between Takamatsu and Kotohira and also to Kotodenshido and Nagao; Shodoshima Ferry and Shodoshima Olive bus services. japanbyjapan.com is a new website developed by JNTO Singapore; it has articles on food, sightseeing, shopping and cultural activities. Consumption tax is now not likely to go up to 10% till October 2019. The most significant news for Tokyo is that it will be the host city for the summer Olympics in 2020. Clearly if you plan to go to Japan at this time you will need to book early. We will post details as and when we hear about them but you can expect to see lots of construction work in the areas where events will be held in particularly on Odaiba, but also Harajuku, see below. Tokyo Station area A guided tour of the Imperial Palace Tour can now be booked on the same day; for further details see sankan.kunaicho.go.jp/english/guide/koukyo.html. You can register for a tour outside the palace’s Kikyomon Gate near Tokyo Station. The tour and instructions are currently given in Japanese but voice guidance in other languages is being added. p107 Diver City (Odaiba) A new Gundam statue is now installed and is approx. 20 metres (65ft) high (compared to the original which was about 18m high). A new feature is that it can change between ‘unicorn’ and ‘destroyer’ modes; this happens at 11am, 1pm, 3pm and 5pm every day. The statue is illuminated at night. Some of the buildings at Meiji Jingu are being renovated; work is likely to finish in October 2019.
p112 Otsuka Toei’s Toden Arakawa line now has an official nickname: Tokyo Sakura Tram 東京さくらトラム. p112 Komagome Rikugien is open to 9pm mid Nov to early Dec as parts of the garden are illuminated for the autumn leaves’ season. p114 Ueno The National Museum of Western Art was added to UNESCO’s World Heritage list in July 2016 as part of the registration of The Architectural work of Le Corbusier, an outstanding contribution to Modern movement. pp116-17 Tsukiji The fish market’s move to Shin-Toyosu on Odaiba has been postponed again because there are still concerns about whether the soil on the reclaimed island is still toxic – it is now possible the move will happen in October 2018. We will update this when we know more. p118 Toden Arakawa Line This tram line is now called Tokyo Sakura Tram (see note re p112). pp120-1 Ryogoku Sumida Hokusai Museumすみだ北斎美術館 (hokusai-museum.jp; Tue-Sun 9.30am-5.30pm; ¥400) has opened here. Hokusai was born in Sumida and spent most of his life there. The museum focuses on his life and has replica art works in the permanent exhibition but original works are shown in the temporary exhibitions. The museum is about a 9-minute walk from JR Ryogoku and about a 5-minute walk from Ryogoku station on the Toei Oedo Line (A3 exit). A useful website for the facilities and services available in Tokyo Station is tokyostationcity.com. The JR East Travel Service Center in Tokyo station is being expanded; the opening hours in the new Travel services/pass exchange area are Monday to Friday 8.30am-7pm, to 5pm on weekends and holidays. pp128-9 Getting around We are grateful to Pin Swede for sending us his experiences re using Tokyo Metro and Toei cards: I always buy these 3-days ¥1500 cards, eg ¥500 for a day of unlimited travel! And since this is Japan it’s always 24 Hours not “calender day” or something stupid (like in some European cities ). So if you clock in at 09.30 Monday the ticket will last to Thursday 09.30. You need to buy them at Narita or BIC Camera Shibuya for example + some other places and they must be paid in cash. And you need to show your passport. Sadly the Asakusa Panda Bus service stopped in August 2016. This website sangyo-rodo.metro.tokyo.jp/tourism/accessible/en has 10 suggested sightseeing routes for popular places in Tokyo; the details for each route include walking times, station exits and detailed maps including where there are toilets and accessibility for people in a wheelchair. Yanagibashi Business Hotel (www.hotel-yanagibasi.jp/en) ‘Location is excellent, staff are amazing, friendly, welcoming, and speak English well. Rooms are small but it’s a fine hotel.’ The hotel is a short walk from the East Exit of JR Asakusabashi station or the A1 Exit of Asakusabashi station on the Asakusa subway line. p147 What to see and do Tony Wasserman has kindly informed us that Universal Studios Japan was modelled on the original Universal Studios theme park in Hollywood, California not in Florida as stated in the book. p153 Where to stay Osaka Prefecture has introduced an accommodation tax: ¥100/200/300 per night for room rates of ¥10,000-14999/15,000-19,999/20,000 or more. Where to stay and eat We have been told that an English-speaking monk (who studied in Manchester) at Eko-In does interesting evening tours of the graveyard (Okunoin) in English. p138 and p41 Odakyu (odakyu.jp/english) has introduced a Hakone Kamakura Pass (3 days; ¥6500) which provides unlimited travel on Odakyu lines to/from Shinjuku and in the Hakone and Enoshima/Kamakura areas. Hakone Ropeway (Cable Car) is now fully open and operates daily (Mar-Nov 9am-5pm, Dec-Feb 9am-4.15pm), though it is closed some days for maintenance and may also be closed again if there is more seismic activity in the area or anything else that makes it unsafe to be there. If the ropeway is closed a replacement bus service will be provided. The Izu Craile Joyful train (Mar-end Sep weekends and holidays; 1/day) now operates between Odawara, Atami and Shimoda. A Legoland theme park (www.legoland.jp/en; day pass adults/children aged 3 to 12¥6900/5300) opened in April 2017. The park opens at 10am but closing time varies between 5pm and 7pm so check in advance. To get there take the Aonami Line from JR Nagoya to Kinjofuto station. p152 & p204 Kintetsu Pass/Shimakaze luxury limited express Kintetsu is operating daily return trips (except Wednesdays) on its new luxury limited express ‘Shimakaze’* meaning ‘Island Wind’ (with seating similar to Gran Class on JR East’s Hayabusa), one each from Nagoya and Namba (Osaka), to Kashikojima (seaside in Mie Prefecture) in the morning and back to those cities in the afternoon. It can be used with Kintetsu Pass*, with extra payment and could be joined from JR at either Matsusaka or Toba. For more information see: Kintetsu Pass. Note: Japan by Rail has not used either the Kintetsu Pass or travelled on this new train but both come highly recommended. A new female calico cat, Yontama, has been made a station master and is now on duty on Wednesdays and Thursdays (10am-4pm) at Idakiso station to give Nitama (Tama II) a break! Nitama is on duty at Kishi station. p260 Where to stay Kyoto City is likely to introduce an accommodation tax in October 2018; ¥200/500/1000 per night for room rates of ¥20,000/20,001-49,999/50,000 or more. Ibis Styles Kyoto Station is opposite the south side of Kyoto Station. Rooms have free wi-fi and there are also coin-operated laundry facilities. pp263-4 Arashiyama LR told us that she ‘was bowled over by the vast and gorgeous stroll garden of Okochi Sanso’s villa’. The closest station to the villa (daily 9am-5pm) is Torokko Arashiyama but it can also be reached if you turn right after leaving the bamboo grove. The entry charge (¥1000) includes a cup of matcha tea. p304 What to see and do The renovation work at the Peace Memorial Museum is now expected to be completed in July 2018.
p304 Getting around Visit Hiroshima Tourist Pass is now available in a variety of areas and validity periods. The small area pass (3 days ¥1000, 5 days ¥4000) includes the tram/streetcar, buses inc the Sightseeing Loop bus and HD Nishi-Hiroshima (Bon-Bus), and the ferry services to Miyajima. The wide area pass (3 days ¥3000, 5 days ¥6000) includes the above as well as various highway bus routes. The 5-day pass includes Hiroshima Airport Limousine bus. Note that JR trains are not included in any pass. The main sights in Hiroshima/Miyajima can be seen in about two days but if planning to stay longer in the area these passes would be particularly useful if you don’t have a Japan Rail Pass. p306 Hiroshima Carp baseball game In 2016, after a gap of 25 years, Hiroshima Carp won the Central League Championship; not surprisingly because of this the number of Carp fans, particularly Carp girls, has increased. Louise Archer suggested we include Mashiko : ‘that’s a great place with a couple of pottery festivals a year’. The pottery festivals in Mashiko (www.mashiko-kankou.org/english) are held in Golden Week and early November. The easiest rail option is to take the JR Mito line from Oyama to Shimodate (23 mins; 1-3/hr; ¥230. Then take the Mooka/Moka railway to Mashiko (40 mins; 1-2/hr; ¥760). We are grateful to Joe Pan for telling us that the SL Ginga operates from late April to early October (not April to June as stated in the book). pp393-4 What to see and do The diorama video in the Former British Consulate has been changed and no longer shows American sailors first meeting with Japanese people. The Sapporo–Otaru Welcome Pass has been discontinued. Taking the Sarobetsu LEX train (approx 4hrs; there is also a slower local train) from Asahikawa to the northernmost point in Japan at Wakkanai (www.welcome.wakkanai.hokkaido.jp) is an enjoyable excursion. Your train may even screech to a halt to avoid the many deer en route to this wilderness outpost. The further north you go, the more sparsely populated and wild the landscape becomes with the line darting between hills, skirting the sea on the left, and revealing beaches, marshes and the sight of Rishiri Island nearby. Fauna lovers may also spot white-tailed eagles and red fox whilst visitors among the sand dune forests around Wakkanai may even glimpse the highly localised Zootoca vivipara reptile. At Wakkanai station, the new spacious atrium has a variety of locker sizes and amenities. Turn left at the exit gates, you will find helpful staff at the Tourist Board Information Centre 稚内観光協会 (daily 9am-9pm) with maps, timetables and pamphlets to help you. Wakkanai Select Café (10am-6pm) doubles as a souvenir shop (9am-7pm) but also harbours a small soba restaurant (10am-7pm) serving a good-value tempura soba (¥430) and a delicious scallop ramen (¥980) if you are waiting for your train back to civilisation. The new building also accommodates a cinema. Beyond the station, shop signs in Russian script suggest the close proximity of Sakhalin (Japanese territory until 1945) and the international entrepôt that is the port of Wakkanai. Outside the National Park, the main attraction here is Cape Soya 宗谷岬, the northernmost point in the Japanese archipelago, accessible by bus from Gate 1 at the corner of the station (6/day; 50 mins; ¥2500 return; last bus out 7.30pm, last back departs 9pm). Here, if you strain, you are meant to be able to glimpse the Russian island of Sakhalin in the distance (your eyesight will need to be very good). You can have your photograph taken at the Cape Soya Monument 日本最北端の地の碑 on the coast. Cross the road and ascend the path into the ‘Peace Park’ to discover the Cape’s military history via a moving assembly of US/Japanese WWII memorials. 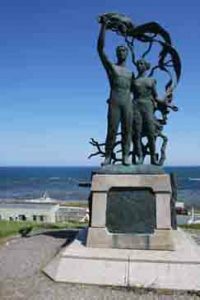 It also contains the poignant ‘Tower of Prayer’ monument commemorating the 269 victims of Korean Air flight 007, shot down in 1983 by a Soviet air-to-air missile off the coast of Sakhalin during the height of Cold War tensions. Back at the station, walk the 4km scenic shoreline road towards Cape Noshappu ノシャップ岬. Striding beyond the fishing boats and their outlaid nets, you may spot small herds of deer and the occasional inquisitive red fox before finally reaching the sunset viewing point out to sea (look out for the dolphin statue). Among a severe backdrop of military radar installations and the second highest lighthouse in Japan; stand here and admire the imperfect outline of Mt Rishiri rising from the deep, a roughened replica of Mt Fuji, its craggy slopes reflecting the physical extremes pressing upon this corner of Hokkaido. 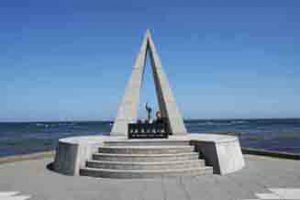 Back in town, a challenging clamber past Hokumon Jinja Shrine 北門神社 leads you into Wakkanai Park 稚内公園, replete with local monuments such as the Peace Gate Memorial offering wonderful sweeping views of the town and sea. From there you can also see the impressive Wakkanai Port North Breakwater Dome 港北防波堤ドーム, a concrete columned wave-shaped edifice built to protect the port from the biting Arctic winds and thrashing seas that torment the city in winter. The summer season does not last long here, with some locals beginning to wrap up warm as early as September. You can follow the ‘Northern trail’ up to the Northern Memorial Museum 北方記念館 and take the lift up to the viewing platform at the top of the Motoe Hiraku Centennial Memorial Tower 開基百年記念塔 (June-Sep 9am-6pm ¥400, 6-9pm ¥200; May & Oct to 5pm) if you wish to catch the sunset although historical exhibits are all in Japanese. From Wakkanai, you can take a ferry (www.heartlandferry.jp; 2-4/day; approx 100 mins) to the two outlying islands of Rishiri-Rebun Sarobetsu National Park. Hiking the trails on Rishiri Island 利尻島 around the famous 1792m Mt Rishiri, is a popular pursuit for Tokyo salarymen, jetting in from Haneda. The marshlands there offer an abundance of birdlife, alpine gardens and natural mineral water sources. Only slightly more distant Rebun island 礼文島, known as the flower island, also offers an abundance of natural wonders for hikers and plenty of fresh local seafood such as urchin and atka mackerel (hokke) to sample. If visiting in the first two weeks of August, be sure not to miss the dancing and fireworks of the Wakkanai Portside Antarctica Festival which prides itself on its Antarctica connection via two Sakhalin huskies Taro and Jiro who helped in Antarctica’s exploration. Their statues stand in Wakkanai Park. Dormy Inn Wakkanai ドーミーイン稚内 (tel 0162-24-5489, www.hotespa.net/hotels/wakkanai; ¥5000/S, ¥8000/D, ¥9000/Tw), a 3-minute walk from the station, is a good budget choice for the traveller and offers an outstanding seafood-enhanced buffet breakfast (¥1500). There is a complimentary ramen noodle served (9.30-11pm) as well as an impressive rooftop spa to enjoy. You can also hire laptops for ¥1000. A similar distance walk to the east from the station will bring you to ANA Crowne Plaza Hotel Wakkanai ANA クラウンプラザホテル稚内 (tel 0162-23-8111, www.anacpwakkanai.com from ¥6300/S, ¥9300/D or Tw). A more upmarket yet good-value alternative, you can also enjoy the scenic views over a cocktail from the 12th floor Astral bar (Mohito ¥1240). Across the street on the far west corner from the Dormy Inn entrance you can eat delicious grilled seafood at Megure Izakaya (Sanma Pacific saury ¥480, hokke ¥800). You can also dine in ANA Crowne Plaza Hotel’s admittedly expensive, season-focused Teppanyaki Hamanasu restaurant (5.30-9pm), or choose the cheaper 1st/ground floor Unkai restaurant option serving traditional Japanese dishes. The earthquake in 2016 is still having an effect. The JR Hohi Line between Higo-Ozu and Aso, and the Minamiaso Railway between Tateno and Nakamatsu are still closed. Aso station can only be reached by train from Beppu/Oita (p430; Aso Boy LEX 2/day), not from Kumamoto. The Kyushu Odan Tokkyo LEX now operates between Beppu/Oita and Aso (3/day); all seats are non reserved. A rapid train operates between Aso and Miyaji. The road to the base of the ropeway is open but the ropeway itself is not operating. It may be possible to see Mt Aso’s crater from spring 2018 but this is not definite. The Yufuin no Mori (2/day) now operates from Hakata via Kokura to Yufuin, not via Kurume. 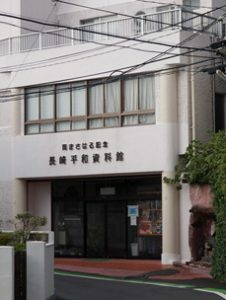 p444 What to see and do Steven Wedema contacted us regarding the 3rd edition of Japan by Rail and mentioned two particular things: the directions for the Oka Masaharu Memorial Peace Museum were not clear and we did not include Nagasaki Museum of History and Culture. We have added the latter to the 4th edition of Japan by Rail and hopefully have made the directions to Oka Masaharu Memorial Peace Museum clear, but just in case we are adding the photo he kindly sent us here as well as Mr Wedema’s comments on the museums as there wasn’t space for those in the book. Nagasaki Museum of History and Culture ‘is well worth visiting for anyone interested in Nagasaki’s history, particularly topics concerning that city’s close ties with Europe (which of course are mentioned in connection with Deshima in your book). The collection is very well laid out and has English labelling throughout. I was also lucky enough to be approached by Mr Ryuhei Yoshizawa, a museum volunteer who offered me a guided tour through the museum in his very good English. With his erudite commentary and humorous remarks he made the visit to this museum well worthwhile for me’. ‘My second comment concerns the Oka Masaharu Memorial Peace Museum, which you very commendably do mention. I can only encourage readers to visit this small museum. Its underlying message is that Japan will never normalise its relationships with its neighbours if it does not face up to its wartime crimes. This message is delivered forcefully, if by simple means. Its collection looks a bit jaded in places and the museum obviously does not have the funding or the status it deserves; the lady at the reception said that the city council “does not like this museum” and thus has omitted it from the official Tourist Office map. All the more reason for anybody with a historical interest to visit it along with the (very well funded) Nagasaki Atomic Bomb Museum. pp448-50 What to see and do Most of the inner parts of Kumamoto Castle are still closed and reconstruction work may not finish till early 2019. The Former Residence of Hosokawa Gyobu is closed till further notice. Kawasemi and Yamasemi D&S trains (3/day) travel between Kumamoto and Hitoyoshi. They are named after kingfisher birds that used to be seen on the line. Trains also designed by Mitooka and have a wood-theme design. Aso Boy (Kuro!) now operates between Beppu (1/day)/Oita (2/day) and Aso at weekends (Fri-Sun plus some Mon) between July and December. pp423-4 The Shikoku Mannaka Sennen Monogatari is a new sightseeing train that operates from Tadotsu to Oboke via Zentsuji and Kotohira. The service operates on Monday, Friday, Saturday and in holiday periods. The Shikoku Rail Pass and Japan Rail Pass are valid for the train but there is an additional Green seat charge of ¥2460. pp509-10 Appendix C: JR service summaries There are still four LEX services a day from Sapporo to Abashiri but for two of them you now have to change train at Asahikawa.